Former Malaysian Prime Minister Najib Razak sat in the dock Wednesday at the start of his corruption trial, with the chief prosecutor alleging he wielded "near absolute power" for nearly a decade during which he stands accused of pilfering millions of dollars from the 1MDB state investment fund. Ten years ago this Wednesday, Najib became Malaysia's sixth prime minister but anger over the 1MDB scandal led to his spectacular electoral loss last May. U.S. investigators say more than $4.5 billion was stolen from 1MDB by associates of Najib between 2009 and 2014. They say the ill-gotten gains were laundered through layers of bank accounts in the U.S. and other countries to finance Hollywood films and buy hotels, a luxury yacht, artworks, jewelry and other extravagances. 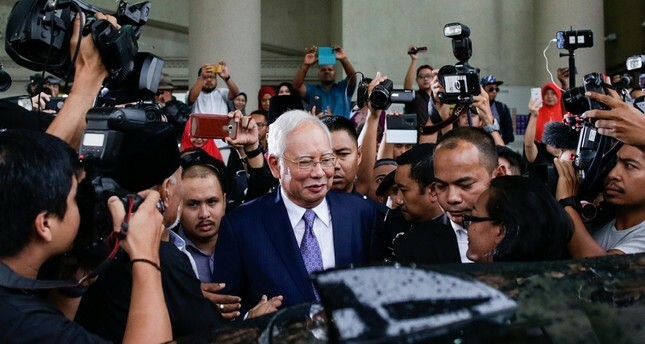 Najib didn't speak to reporters as he left the courthouse. He later wrote on Facebook: "God willing, I am confident that a court that is fair will prove that I am not guilty. We will continue to fight."